This article explains a recently disclosed vulnerability via the Google project zero bug tracker , independently discovered by the Google's Project Zero team and by Quarkslab some months ago. To our knowledge, this vulnerability was present on all Samsung devices using Android 5 and allowed remote code execution as system user simply by browsing a website, by downloading an email attachment or via a malicious third party application with no permission. On Samsung devices using Android 5, an Android application running with system uid is monitoring file operations on the /sdcard/Download/ directory. It uses a Java FileObserver, a mechanism based on inotify. When a filename begins with cred and ends with .zip is written in that specific directory, a routine is called to unzip the archive and to remove it from the /sdcard/Download/ directory when it's done. The unzip routine extracts files present in the cred[something].zip archive to the /data/bundle/ directory. Unfortunately, no validation is performed on filenames, which means that if a filename begins with ../, it will be written outside the /data/bundle/ directory. This allows an attacker to write arbitrary content at an arbitrary location with the system user rights. Let us precise that new directories are automatically created by the unzip routine and existing files are overwritten if the system user has the right to do it. Obviously, arbitrary file writing as system user leads to arbitrary code execution on Android. Now, considering that the /sdcard/Download/ is the default directory where Google Chrome and the stock browser store the downloaded files, or where the GMail application saves the email attachments, you have a remote code execution vulnerability. Visiting a web page via any browser (including Google Chrome). Downloading an email attachment via the GMail application. Installing a malicious Android no permission application. How to detect if you are vulnerable ? We wanted to allow easy and quick detection of user's device status. To do so, we implemented a module  for the open-source project Android VTS . Thus, detecting if your device is vulnerable or not is as simple as installing and running Android VTS. The application can be found on Google Play (https://play.google.com/store/apps/details?id=com.nowsecure.android.vts). The following analysis has been done on a Samsung Galaxy S6. The vulnerable code is located in the application Hs20Settings.apk. It registers a BroadcastReceiver named WifiHs20BroadcastReceiver which is executed at boot, and also on some WiFi events (android.net.wifi.STATE_CHANGE). Let us note that the vulnerable code can be located elsewhere on some Samsung devices. 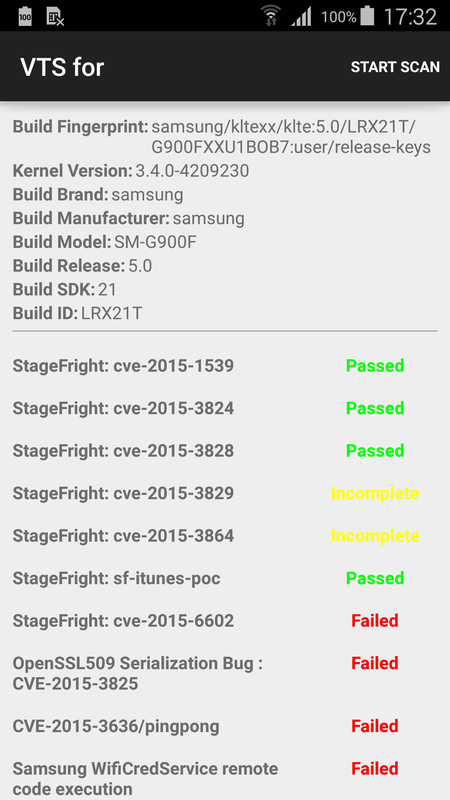 For example, on the Samsung Galaxy S5, the vulnerable code is in the application SecSettings.apk instead. Monitors files (using inotify) to fire an event after files are accessed or changed by any process on the device (including this one). FileObserver is an abstract class; subclasses must implement the event handler onEvent(int, String). Each FileObserver instance monitors a single file or directory. If a directory is monitored, events will be triggered for all files and subdirectories inside the monitored directory. An event mask is used to specify which changes or actions to report. Event type constants are used to describe the possible changes in the event mask as well as what actually happened in event callbacks. When an event of type 8 (FileObserver.CLOSE_WRITE) is received, some checks are done on the filename and actions may be taken. If the written filename begins with cred and ends with .conf or .zip, then some processing is performed. In all other cases, the FileObserver simply ignores it. It's a .conf file: the service reads the file calling readSdcard(), then the configuration is passed to WifiManager.modifyPasspointCred() and, finally, the .conf file is deleted after the call to readSdcard(). It's a .zip file: the service extracts it to /data/bundle/ and it calls loadCred() to parse the content of a cred.conf file extracted. Then, it calls WifiManager.callSECApi() with the result from loadCred() as an argument inside a Bundle object. The .zip file is deleted after the unzip operation. The first case is not really interesting to us, but the second one is. The unzip operation is done using the standard ZipInputStream class, and it's a well known issue  that if no validation is done on the filenames inside the archive, a directory traversal can be performed. The vulnerability is similar to the one reported by @fuzion24 in the samsung keyboard update mechanism . One can notice that files in the archive are not verified for potential directory traversal issues. Hence, if we have a file cred.zip or cred[something].zip written in the /sdcard/Download/ directory, WifiHs20CredFileObserver automatically (i.e, without any user interaction) extracts the content of the archive in the /data/bundle/ directory and deletes the zip file afterwards. As no verification on filenames is performed in the decompression routine, any file within the archive beginning with ../ is extracted outside the /data/bundle/ directory and existing files are overwritten. Keep in mind that the unzip operation is done as system user. Now, let us think about how to transform that into code execution. Now, how to get a code execution? When you have the capability to write data anywhere you want as system user, the typical solution is to overwrite some files inside the dalvik-cache. On Android 5, the dalvikvm is not used anymore, as it has been replaced by the ART runtime. In the same way as ODEX files, OAT files are generated from an .apk via by the package manager by invoking dex2oat and the resulting files are written to the /data/dalvik-cache/ directory (with .dex extension). Though, we can still use this method to get code execution. Unfortunately (or not, depending on your side), it is important to note that overwritting the dalvik-cache for code execution is almost impossible now. On recent ROMs, the dalvik-cache directory is now owned by root and write access is restricted by SELinux  . Some old Samsung ROMs running Android 5, like G900FXXU1BNL9 or G900FXXU1BOB7, did not include these SELinux rules, and thus were vulnerable. On these ROMs, the dalvik-cache directory was indeed owned by root, but no SELinux rule prevented an arbitrary system application from overwriting files in the dalvik-cache (files are owned by system). We will consider one of these ROMs as an example for this article because it's not the point of this article to explain other ways to execute arbitrary code as system without writing in dalvik-cache. Now that we have a ROM exploitable through the dalvik-cache, we need to find an interesting target application (running also with system uid) to overwrite and we need to figure out how to generate our own OAT file. The unzip routine is written in Java, and decompression is done byte per byte, which is pretty slow on big files. How will you execute code from this application? Looking at the application's manifest, we can see that it has some kind of "autorun" capability by registering a BroadcastReceiver listening to android.intent.action.BOOT_COMPLETED events. As a consequence, if we put our custom code inside the method onReceive() of the class AccessControlReceiver, our code will be executed each time the device boots. Let's do it to validate our theory. > adb pull /system/app/AccessControl/arm/ . 2 files pulled. 0 files skipped. > adb pull /system/app/AccessControl/AccessControl.apk . > adb pull /data/local/tmp/modified.oat . That demonstrates that we managed to get code execution for this vulnerability by overwritting an existing file in the dalvik-cache. Of course, this is not optimal because we need to craft the right OAT file, which is unfortunately device and even ROM specific. An easier and more reliable way to exploit this vulnerability would be to do it with multiple stages. First, we need to get code execution on the device as a less privileged user, and focusing on reliability (i.e, without overwriting something inside the dalvik-cache). Then, we can use your unprivileged access to the system to build a compatible OAT file for AccessControl.apk, using tools like dex2oat directly on the device, and finally build a cred[something].zip ZIP file on the SDCard to write your custom OAT file inside the dalvik-cache and achieve code execution as system. As we have seen in this article, OEM customisations are still the weakest point in Android security. Why would you like to have to escape a sandbox or defeat system mitigations (ASLR/canary/...) to achieve a reliable exploit when your smartphone manufacturer gives you the opportunity to have a 100% reliable exploit through a logic vulnerability?